I am beyond excited at how the cookie sandwich soaps have turned out so far. I was shooting for a chocolate brown color, but the brown pigment I have wasn’t looking overly chocolatey, so I added the tiniest dash of black matte powder. I had never used powder coloring before, but of course I had researched and knew that a tiny bit goes a long way. I didn’t realize that a sixteenth of a teaspoon was a lot in this situation. Lol. 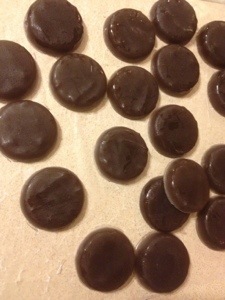 I was kind of upset when I was whisking the batch and saw how dark the soap was turning, but you know me and waste…I decided to pour them and I could remelt for something else later, but they’d be in handy wafers instead of a massive clump. As they began to set I noticed that they continued to darken (I think it was actually the settling of everything from all of that whisking since it took awhile to incorporate the powder). I’m so happy with them now though! They look like chocolate grasshopper cookies or York miniatures. I can’t believe it. I still need to make the frosting to sandwich and I’m going to let that look rather whimsical so that these don’t look too realistic. In the picture they’re a little glossy, but that will dull in a bit. I had a lot of trouble getting them to release from the molds and popped them in the freezer to contract, to unmold. Yeah, um…*blush and suddenly looking all around* I popped them in as I prepared the supplies to paint the trees and I lost all track of the entire world once I started painting. After I was down I was on cloud 9 and got on SL for a couple of hours. I came out to make my tea and was tidying up when I saw an empty mold sitting on the counter. *facepalm* I ran over and yanked the wafer molds out of the freezer. I had left the tree mold on the counter since I was going to add the wafer ones after the ten minute cool down, so I’d only do one round of equipment washing (I take extra measures for that, so it’s a real pain to do it in multiple rounds). Thankfully these soaps won’t be ruined, but I need to let them slowly return to room temperature. If the condensation stays on them I run the risk of the fuzz popping up on them. It’s a common issue that occurs because glycerin is a humectant, so it draws water from the air, and then whatever itty bitty particles are in the air stick to the moisture, making the soaps look fuzzy. The fuzz can sometimes be wiped off carefully with a damp towel, but that can leave a mess too, and I’d rather write off a soap’s cost than sell something that I’m not proud to have my name attached to. So, I’m going to set an alarm next time I have to use the last resort of freezing a mold. Lol. Anyway, I think they’re adorable and can’t wait to make (and post) Part 2. *grin* Let’s hope that part turns out well too!